Brevard County, Florida's Choice for Collision Repair Service, Custom Painting & Welded Rust Repair. Melbourne, Palm Bay, Rockledge and Viera. Personal, professional service. "We work for you." We are collision repair and welded rust repair experts for Brevard County. We work for YOU, not the insurance company! Accidents happen, big and small, but the bottom line is that it is YOUR damaged vehicles. We want to restore and repair YOUR vehicle to make it "like new." Give us a call and found out how we work. No headaches, Body's by Doug negotiates for you with all insurance companies to make the job right. Rental car or transportation to and from our shop are available. Up to $250 Off Their Deductible on Any Insurance Claim! 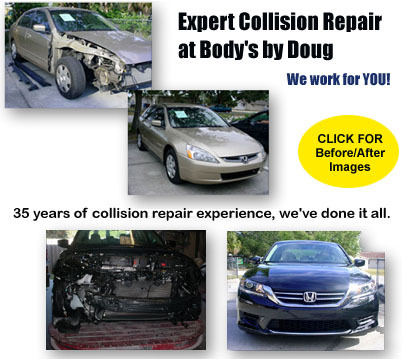 Looking for a convenient and dependable auto accident repair services in Brevard County?Body's by Doug offers precision collision auto body repair, factory-quality painting and 35 years of experience in high-end, custom & restoration services. We know how to help expedite your claims for insurance car repairs. Body's by Doug's estimating and insurance pros can speed you through the process. We are a Preferred Insurance Repair Shop. Click here to read what your insurance company DOES NOT want you to know. We do Fleet Repair too, keep your business rolling! We can contact your insurance company, as well as assist in resolving the claim and complete the paperwork. We'll also help with rental car arrangements and scheduling of your accident repairs. Our quality body and paint technicians will bring your automobile back to its original factory condition. We aim to make your "collision repair headache" a positive and "hassle free" experience. We know all you want to do is "get back on the road...fast." From scratches to dents to total paint job, no job is too small. We have years of experience with repairing rust damage from the Florida salt air, give us a call for an estimate. Includes both bumpers, hood, roof, & decklid. Professionally painted on with clearcoat entire panel.